In this article we'll be detailing the steps you'll need to take to add images to newly created tasks (or changes/add additional images to already created tasks). 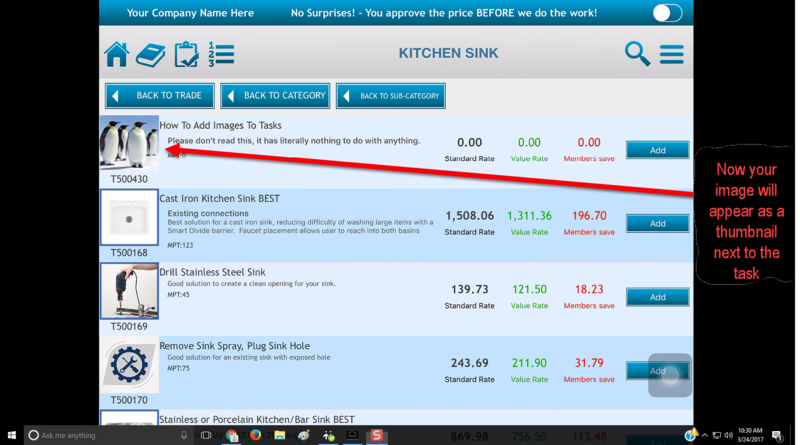 First, you'll need to open up the and log into your profit rhino account, once you've made it in their go ahead and click on the Task tab, and create a new task (go to a task that already exists). After that, scroll down and you'll find a series of categories, one of them being images, click on that tab and we can begin working on the magic. The following image illustrates what the page should look like. As you can see above, there are several different add image buttons. 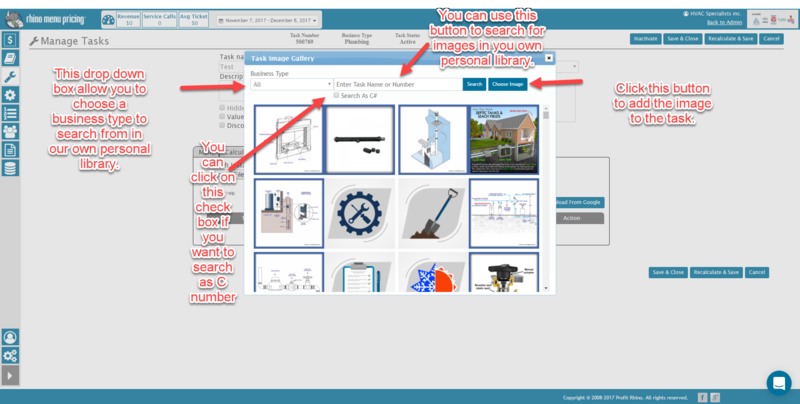 These buttons appear in the following order from left to right, [Add Images From Global Library]. [Add Image from Your Library], and [Upload New Image]. If you click [Add Images From Global Library] you'll be able to choose from images stored on Profit Rhino's library, and images saved in your own personal library. The following image demonstrates. This is useful if you don't have any images saved in your own personal library for any particular reason and you want to choose from the ones that we've included with the application. If you click [Add Image from Your Library], you'll be search for images that only reside in your own personal library. The following image demonstrates. This can include images you've added to your personal library from your computer, found online and saved, and etc. In addition, if you don't want to look through our stock images this is the button you'll want. If you click [Upload New Image] you'll be able to upload an image that is only saved on your personal computer. The following image demonstrates. After you've selected choose file, it'll pull up a function that will allow you to search for images on your computer. After you've selected one you'll need to crop it to the proper size and it'll be all set to go. This is useful if you only want to be looking at images that are saved on your computer and not need to sift through your other libraries. Now, lets say that you have a task that needs to encompass more than just one picture, what would you do then? That won't be a problem either, you simply repeat the process detailed above and then choose which order you'd like those pictures to appear in when presenting your tasks to customers. 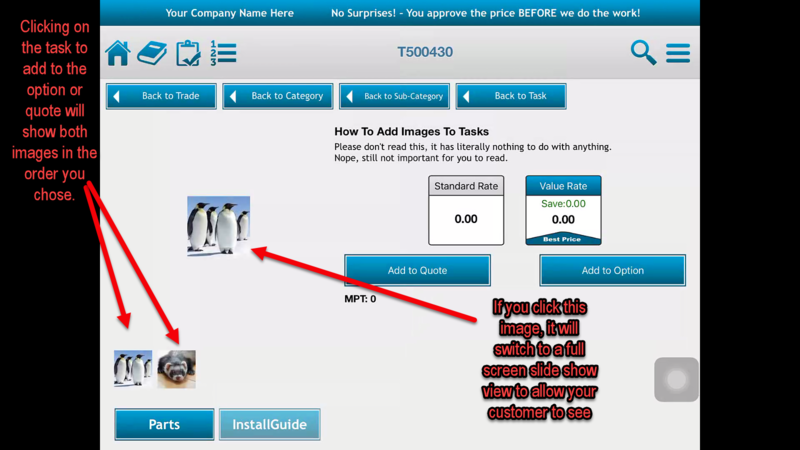 Now that we've seen all the different ways you can add images to your tasks, we're going to take a quick look at what it looks like to customers out in the field when a task has an image added to it. If you open up the application in your tablet and then head over to the task you've added images too, you'll be able to see the image that you've added show up as a sort of thumbnail next to the task. If you've chosen to upload multiple images, the image that you've marked as "1" will appear as this thumbnail. Alright, that should cover everything you'll need to know about adding an image to a task. Remember, people are primarily visual, and your customers will most likely not know very much about the work that they'll need done on their homes. They won't be able to picture a part just by hearing what's it called, and they may not comprehend the scope of what you're doing, before you do it, unless you provide them with some imagery to clear it up.